In his statement, Sanders, who is among the list of possible contenders for the Democratic presidential nomination in 2020, said it has been an honor to serve Vermonters and that there is more to be done for working families across the country. 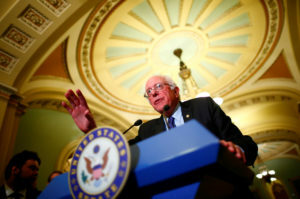 “Our struggle to create a government which represents all of us and not just the one percent — a government based on the principles of economic, social, racial and environmental justice — must continue,” Sanders wrote in a statement released by the campaign. He said that the 2018 midterm elections will be a “pivotal moment” in United States history and he plans to fight for an agenda that puts working people first. Sanders is credited with starting a national movement when he challenged Hillary Clinton for the Democratic Party’s presidential nomination. His campaign, where he pushed a progressive agenda and ran to the left of Clinton, ultimately garnered 43 percent of the Democratic primary vote. Since then, he has emerged as a prominent critic of Trump administration policies. He has also encouraged the Democratic Party to field more progressive candidates. Jose Aguayo, the treasurer of a food cooperative in Montpelier, applauds Sanders’ role in engaging younger voters nationally and discussing issues important to liberal voters. In his announcement, Sanders outlined a number of issues he plans to push for should he win re-election, including a Medicare for all single-payer program, a $15 minimum wage and free tuition at public colleges and universities. Several little-known candidates have come forward to run against Sanders, but he has not received a major challenger, yet. In 2012, Sanders ran as an independent but also won the Democratic primary. He won re-election that year with 71 percent of the vote. How much will Democrats benefit from Pennsylvania’s new congressional map?